Color guard hosts competition, performing "Beyond the Sea"
As I walked into the high school to witness the final color guard practice, I had to push my way through a throng of excited basketball fans. Not many students know much about the demanding sport known as color guard, but this activity should definitely receive more attention than it presently receives. The Lampeter-Strasburg team, consisting of Faith Osborne, Callie Fisher, Remi Clay, Jesse Vangelist, Sarah Baxter, Bethany Bradford, Kayla Pugliese, Christine Fritz, and Maddie Swope, started setting up as I sat and watched. As a person who rarely ventures out to football games, I knew virtually nothing about the sport. I knew that there were flags and dancing involved, but that was about it. As I watched the team members set their mat up, I already was blown away by the amount of synchronization required even in the relatively simple tasks. Members of the guard spend eight hours every month at guard camps, practicing flag spins and catches, dances, setting up, and showmanship. Being a guard member means dedicating a larger amount of time to the activity, and it almost becomes a way of life. They have been working on the routine for this event since November. Because the team must seamlessly move in unison, they form close bonds, making distorted faces at each other during practice and providing advice on how to land that jump or toss that rifle. They act like family. “[We] used the ocean theme from the song to portray two long-lost lovers, either separated by the sea or by death,” explains Stephanie Rowe, color guard director at L-S. The groups are judged based on their ability to toss, hold, catch, and manipulate the flags, as well as their ability to catch and spin the rifles, a tricky move to pull off. The rifles are composed of solid wood, so they are heavy and difficult to control. The competition lasted from early in the morning, officially around 11, to late at night, between 9 and 10. The performers ranged from middle school groups to marching percussionists, but it focused on the artistic talents and precision of the guard groups. At this competition, L-S performed an exhibition show. “[Exhibition] means that we don't get placed. When ever it's a home competition you don't get placed because it's 'home turf' and you are running the thing. We still get scored but it doesn't necessarily count,” Bethany Bradford, a junior who has a solo during the show, shares. Compared to some other teams, our group impressed with amazing synchronization and hard work. The act looked so fluid, just like the water that their performance represented. 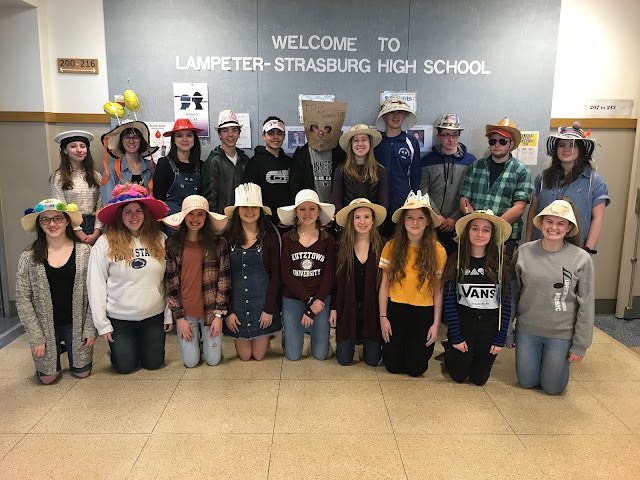 The Lampeter-Strasburg team will compete in 10 other shows this season, with a culminating performance in May. The girls travel to Wildwood in Atlantic City, New Jersey, where they will compete against 57 other groups. They will also take part in an international competition at the end of February in New Jersey as well, called World Guard International (WGI). This is undoubtedly a representation of the talent of our team. And as the girls work harder on their routine for the upcoming competitions, their familial bond will only get stronger. Just like the waves that these students chose as their theme, they will only become bigger and more impressive as time goes on.